We give our customers the chance to fully focus on their core business - we call it carefree IT! Managed Service is a service concept that means that companies choose to let other companies manage all or selected parts of the company’s systems, processes or functions. For Infozone, Managed Services provides an opportunity to offer our customers a stable and efficient IT environment where the customer is given the opportunity to fully focus on their core business. We have the opportunity that we can handle all or part of your IT environment through operation, management, monitoring and support. 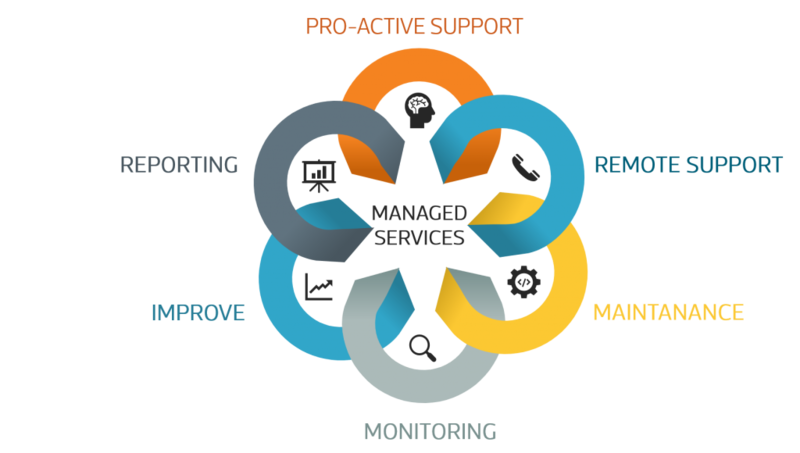 Managed Services aims to optimize the development, operation and support of our customer’s IT environment and create a cost-effective solution based on your needs. Infozone’s Managed Services also aims to look into the future in partnership with you and work proactively. To cooperate in developing our customers’ IT environment with a goal of being able to deliver security, simplifying administration and reducing costs. Pro-active Support – Through continuous external monitoring, we work to create a stable and secure IT environment for you for the future. Remote Support – Through our expertise in several different areas you are given access to experts in our various service areas and receives a first-class support. Monitoring – We keep check on the components and services to be able to act as quickly as possible and to begin troubleshooting even before the user detects the problem. Improve – We always strive to maximize the benefits of all IT investments throughout the life cycle. We are constantly working to improve the systems managed; through both technology and processes. Reporting – We report and provide statistics to our customers regarding issues related to operation and support such as ongoing activities, projects, cases etc.